Social networking has had a profound effect on the way in which people use the internet to learn. As I work part-time in a FE college most social networking sites are blocked on their computers therefore I needed to find a new social application to share this experience with my students. Luckily yesterday afternoon, as I scannned Twitter for useful links, I came across Glogster. Glogster is an online tool that can be used to create and share interactive posters and pages. You can embed videos and music, upload photos and border/design them. You can print attractive pieces of text then share them with a webpage link. A quick search for the term ‘esol’ produces three pages of results. Here is a one that I found relating to Cultural Awareness. There are a number of ways in which you could use this web page with your students. You could click on the flower and play the interactive vocabulary games. 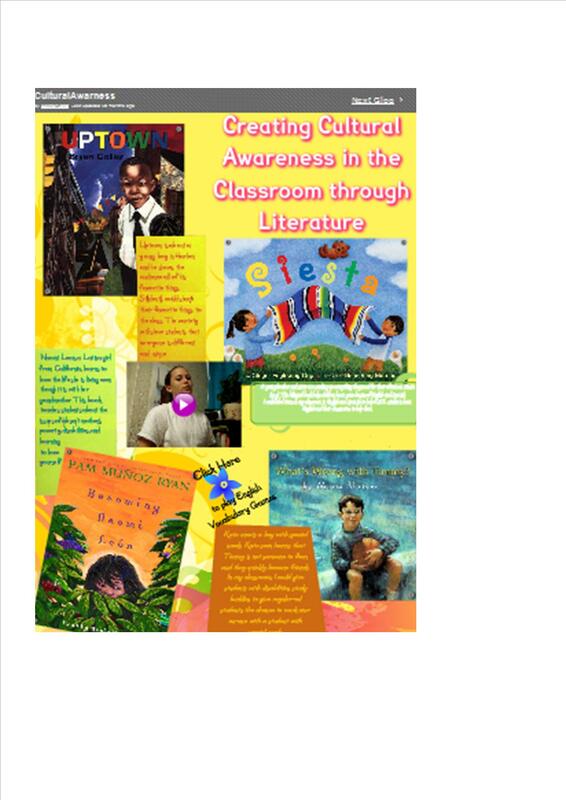 The students could read the descriptions of the stories and then choose one of the books to read, or you use the page as a starter for a discussion about cultural awareness where each student describes what they know about a partners original culture. As well as viewing other students pages your learners can also sign up to the service for free and begin creating their own pages. Glogster Edu has been specifically designed to be used by tutors and students. With Glogster Education you can create class projects, assign home work, create student portfolios and manage student accounts. In this video you will see how Glogster can be used as a support tool for short oral presentations. This entry was posted in Resources and tagged ESOL, Literacy, Resources by Gemma H. Bookmark the permalink.